"I expected to get it a lot further down the line in my career"
Ed Sheeran, coming to an issue of Total Guitar very soon! 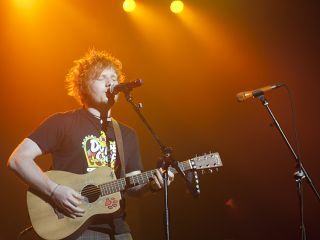 You might expect award-winning, million-selling singer-songwriter Ed Sheeran to be doing the rounds in arenas and on festival stages these days. However, yesterday saw the star take to the stage in the intimate surroundings of Bristol Fleece in aid of the One25 charity. We caught up with Ed for a forthcoming issue of Total Guitar magazine and asked him how it felt to win best song musically and lyrically for his hit single The A Team at last week's Ivor Novello awards. "That's the one award that as an artist I've always chased," Sheeran admitted. "I expected to get it a lot further down the line in my career, so to get it for the first song I released was a fantastic feeling. "It's a room full of people that I admire and look up to who voted for me to win it… it's the perfect award for any artist. I'm honoured to have it." For much more from Ed Sheeran, pick up Total Guitar magazine issue 230, on sale 9 July. Total Guitar is now available on Apple Newsstand (US readers click here).